We have global communications and transportation. In Europe, most of the Americas, and most of Asia at least, we have enough food to eat and wondrous technological gadgetry. Anyone labeled “middle class” today lives a far more luxurious lifestyle than royalty did less than a century ago. Some of our most basic problems, such as bigotry, racism, and other social ills have been at least partially resolved, for at least part of the world. Will we ever be able to finish the job? I submit the answer does not lie within the bounds of governments and politicians, It lies in diminishing the mismatch between the relatively steady pace of evolution and the accelerating rate of technological advancement. Our species may be on the cusp of such an advancement. Human beings evolved on the plains of Africa. We were smaller, slower, weaker, and had less effective sensory apparatus than the alpha predators. We didn’t even have biological “weaponry” (such as fangs, horns, or claws) to defend ourselves. How did we achieve mastery over lions, leopards, and hyenas? We lived brutal, tribal-centric lives as we evolved higher intelligence. Other animals adapt to their surroundings, humans learned to adapt their surroundings to themselves. We learned to use fire to cook meat. Cooking made it easier for our bodies to absorb the protein value of the meat, which allowed our brains to add more neurons per volume than our primate cousins – and other mammals with similar-sized, or even larger, brains than our own. Other animals can use simple stick and stone tools; humans are the only species that tamed fire. This started humans down the path of technological advancement. Fire. The wheel. Bronze. Iron. Steel. The lens. Science. Industry. Atomic energy. Space flight. Internet. But while our technology advances faster and faster, human evolution follows at a more leisurely pace…for the moment. For example: We vilify adults who engage in any kind of sexual activity with minors, but the concept of “minor” is a modern legal distinction, not a biological one. Girls reach physical maturity well before we consider them to be of sufficient emotional maturity to have children – because adults now live long enough to accumulate much more knowledge and wisdom from the ever-increasing store of knowledge and wisdom available that the gulf between a 25, or 35, or 55 year old man and a 13 year old girl renders a sexual relationship between them abhorrent to us. But before the advent of civilization and the division of labor, humans that made it to 30 were elderly! Most people died in their 20s or earlier of disease, tooth decay, or child birth. It was necessary for a girl who was physically old enough to bear children to start doing so – for the sake of the survival of the clan or tribe. The modern concept of maturity didn’t enter into it. Our distant human ancestors didn’t have to worry about homework, getting a job, health insurance, paying the rent, career advancement, global warming, elections, or taxes. They had to worry about finding food for themselves even as they sought to avoid becoming dinner for a big cat. ALL humans lived like that as recently as 10,000 years ago – a mere eye-blink in evolutionary timescales, and a few, isolated, human cultures still live that way to this day. Culturally, we have had varying degrees of success in putting aside our physical differences in gender or coloration or belief and living together, but there is still friction, conflict, and in parts of the world, warfare over these differences. It takes enlightenment to put aside the tribalism that defined our social development for untold millennia and behave at a higher level than out stone-age ancestors, who’s DNA still forms the cornerstone of our genetic makeup. Treating people as property, warring against competitor tribes for resources, superstitions about unseen forces that can literally blow apart a mountain, light up the sky, and move the earth, fear of the unknown – they all come from the same place – from our infancy as a sentient, sapient, species. Some recent breakthroughs in genetic engineering may have put us on the verge of being able to routinely and casually alter our own DNA – in effect, to design our own evolution. But we aren’t there yet. Realizing this about ourselves may herald our transition to “toddlerhood” in the climb up the ladder of species maturity. I gave thanks on Thursday that I don’t have to worry that my lack of fang or claw will doom me to fall prey to an animal that has them; that in fact I may live to see our species make its first self-directed evolutionary steps – if our scientists can overcome our cavemen! 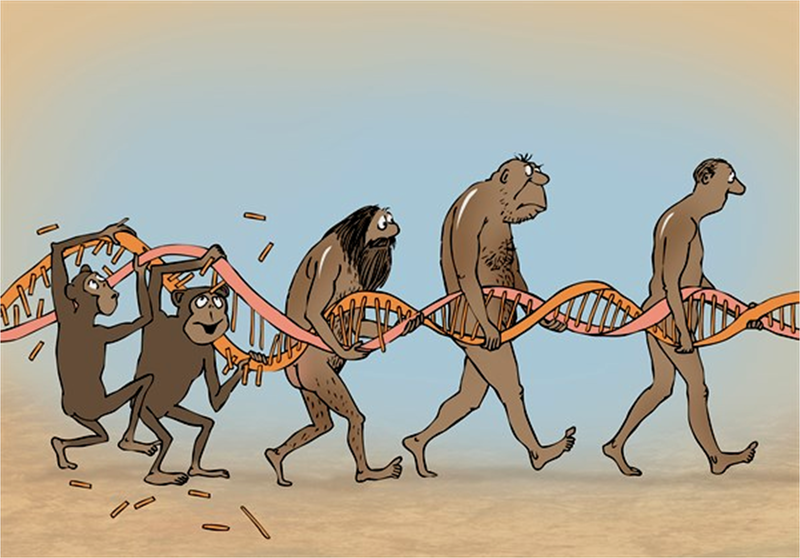 This entry was posted in Science vs. Pseudoscience and tagged accelerating rate of change, cavemen, DNA, evolution, genetics, technology, tribalism. Bookmark the permalink.